There are few events more magical than a Florida beach wedding, and for Jessica and Justin Masko of Fort Pierce, Florida, having all of their family and friends present for their Venice Beach wedding only added to that magic. The happy couple exchanged their wedding vows on August 24th, 2014, with the stunning backdrop of warm gulf waters behind them and sparkling white sands beneath their feet. From the preparations for the ceremony to the reception at Bentley’s Boutique Hotel in Osprey, FL, Jessica and Justin’s wedding proved that when it comes to weddings by the water, the natural beauty of a Florida beach creates memories so special that they become more than just a fond recollection; instead, they become a part of the family’s shared history. As preparations began, Justin got a little help from the men in the family and from friends as he donned his wedding clothes. 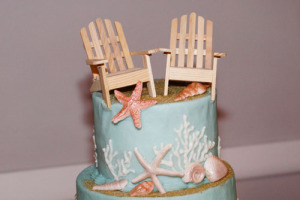 Once they were dressed, the men in the wedding party headed outside to have their photos taken under the beach’s tiki bar sign, which congratulated the happy couple. The men all wore matching suits of white and tan, with turquoise ties that were the perfect complement to the nearby gulf waters. Meanwhile, Jessica’s friends and family helped her into a dress, and just before she stepped outside to walk to the archway by the beach, she shared a happy moment with her dad, getting a sweet kiss on the cheek before taking the first steps toward her new life with Justin. Out on the beach, the guests were showed the way with whimsical beach-themed decorations. Once the couple stood under the simple bamboo archway, which was adorned with gauzy white fabric, they exchanged vows and performed a unity sand ceremony, blending two different vases full of sand to represent the joining of their lives and hearts. Once the ceremony was complete, the wedding party enjoyed posing for pictures on the beach, including several group shots that included all who attended. These keepsake photos are sure to be cherished by the couple for years to come as the backdrop of the sun-lit waters takes them back to that one special moment when they were surrounded by everyone who shared in their special day. Later, the couple shared intimate moments on the soft white sand, sharing their first kisses as husband and wife as the sun set on Venice Beach. Once the wedding party and guests arrived at Bentley’s Hotel in Osprey, Florida, the party kicked into high gear. Before toasts were given, everyone enjoyed a limbo dance entrance, including the bride and groom. Toasts were given by the best man and the maid of honor before the couple enjoyed their first dance together. 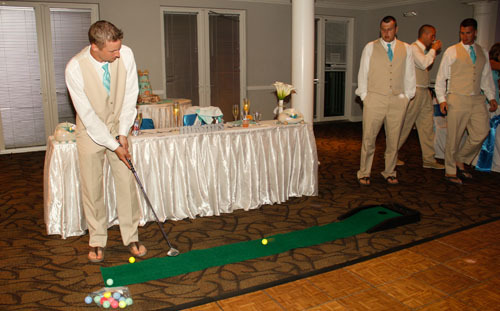 The relaxed theme of the wedding continued on at the reception, where a hole-in-one game was set up for family and friends to try their luck. 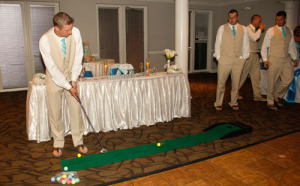 For each hole in one that was scored, the bride and groom shared a kiss, adding a whimsical element to the evening. The toasts continued at the bar throughout the evening as everyone who shared in this special beach wedding gave the happy couple all of their well wishes. From vows on the beach to intimate moments shared during a Venice Beach, Florida sunset, Jessica and Justin’s beach wedding created special memories that are sure to last forever for everyone who attended. Summary: Jessica and Justin Masko’s Venice Beach wedding proved that when it comes to weddings by the water, the natural beauty of a Florida beach creates memories so special that they’re more than just a fond recollection; instead, they become a part of the family’s shared history.